From now until the new year (January 2nd), get an unprecedented 30% off of everything, including memberships*, downloads and DVDs. We are tremendously grateful to everyone who made this year so amazing, and this is a small way of saying "thank you". To apply the discount, simply use the code THANKYOU when checking out. Thank you! Thank you for everyone who submitted killer features this last month as part of our "Killer Feature Contest". We got some great ideas, and are looking forward to incorporating many of them before too long. Because we got so many equally great suggestions, we chose the winner randomly. Thanks again! This week we wrap up our chapter on creating and modifying feature modules. We talk a bit about strategies around organizing components, and re-organizing them as your site and various components evolve in purpose and function. Next week things will get even more fun as we explore how to get everything else that we can't wrap up as a feature module into some kind of version-controlable code. The first changes you make to a feature module can be the most daunting. In this video we walk you through getting these changes to your production site and explain why sometimes we'll see changes in a feature module's code that we didn't actually make. In this video we take our changes and merge them with our coworker's changes to demonstrate one of the most powerful features of Features: the ability to merge configuration changes without blowing away someone else's work. From time to time you may want to re-organize feature-based components into different feature modules in a way that makes more sense for an evolving web site or application. In this video we explain how. In this video, we explain various other components that can be bundled in a feature module, and how to leverage an existing feature module to deploy a whole series of configuration changes on a completely separate site (one of the other huge benefits of wrapping up configuration in a feature module). Once you wrap your mind around the power of a feature module and the basics of updating and manipulating it, the next question you're likely to have is 'where do I put which component?' In this video, we talk you through how to organize components in a sustainable, reasonable way. The structure will help you stay focused and engaged, allowing you to learn more. If you will be attending DrupalCon, this training will be a great way to kickstart the week and let you to get much more out of the sessions and other events you'll be taking part in. The cost is $350 for an entire day of excellent training with highly experienced trainers, plus a free 3-month membership. So what happens now that we have a local feature module, and a group of configuration components on our production site? In this video, we show you how to move the feature module to production without anything exploding. Last week we looked at how to create a feature module and roll back changes. This week we dive even deeper, looking at how to review the actual feature module code, and use Git to review changes between one version of our module and the next. We then dive into a practical example of deploying our feature module to a live site, and bringing configuration changes from multiple users together in a single features module. For those of you who have experiences configuration deployment woes, this will be really exciting to see in action. The Features administration can give us a great birds-eye view of what's in our feature module, but reviewing the actual code can tell us more about the specifics. In this video we show you how nearly every feature module is structured and what you can learn from digging into the code. Previously we looked at using the Drupal Diff module to review changes between our feature module and our current configuration. In this video we show you how to get updates to configuration back into our feature module and then look at the changes between our two module versions with Git diff. Once we have our configuration changes in code and under version control, we can roll back the changes with Git, and in this video we show you how. This is where features starts to get really fun. Without features, when multiple people make changes to the same configuration - a view, for example - and attempt to import these changes to a production site, things can get a bit wonky. WIth a feature module, however, these changes can be pulled together easily and deployed very quickly. In this video we walk you through how this is done. For this week only, you can purchase a download or DVD of the newly released "Change Management and Version Control" collection for 20% off. This collection walks you through how to use powerful Drupal utilities like the Features module and Drush, and teaches you how to use the Git version control system from the ground up. Learn how to work side by side with team members on the same code base, develop clear strategies for deploying from development to production, and clear up any questions you might have on building a solid personal workflow for dealing with code changes in the long term. Weighing in at over 9 hours and 120 individual videos, this is an extensive, thorough overview of critical techniques you will use every day. Last week we looked at how to get your entire database into version control, which isn't always a perfect fit, but can come in handy especially in the development phase. This week we begin a multi-week exploration of using the Features module to capture the most essential configuration components from our database into code. Features can be a little tricky, but we walk you through the creation, deployment and syncing of Feature module step by step, and explain the reasoning behind each step. In this video we create our first "feature module" (a module created through the Features module). We also talk about each of the database components we're able to pull into our module. Once you've seen how the Features module works, we'll step back and talk a little bit about why Features makes so much sense for many projects. One of the biggest hurdles to using Features is figuring out what to do to update configuration that has already been captured into a feature module. Do you just update your view or content type and hope for the best? In this video we start discussing the various options, beginning with how to roll back a configuration change that we don't intend on keeping. Sometimes it's difficult to tell exactly what changes have been made to configuration that has been captured in a feature module, but with the Diff module we can look at exactly what the changes are and decide from there what we're going to keep and what we might need to roll back. The new videos this week walk you through the first steps of using the Features module, but before you do that, you'll need to actually install it. It's pretty straightforward, but we wanted to walk you through the process to make sure we get all the steps covered. Only 2 more weeks left in our Killer Feature contest. Send us an email with a killer feature suggestion and we'll pick one of our favorites to receive a free DVD of your choice. This is a great way to contribute to making Build a Module.com an even more awesome experience than it is. 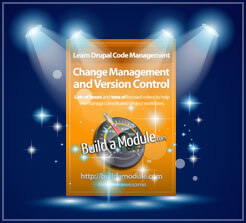 This collection is ideal for anyone who is actively managing a Drupal project. The techniques covered - as always - are practical and used in real-world situations. When you complete the series, you'll have a set of incredibly powerful tools at your disposal that will help you work within or manage a team, and greatly increase your productivity as an individual developer. Last week we talked about how to manage assets with version control, and in this week we dive a little deeper by going into how to get our full database into version control, and what the implications of that are. We then roll this into a feature branch and talk about best practices for managing your database in your repository over time. Generally, getting your database schema (data about table and fields) into version control is a good idea both for backups and for looking at changes over time. In this video we talk you through how to do this via the command line for easy future automation. While it's not always a great idea to store the full content of a database in your repository, there are some situations where it makes a lot of sense. In this video, we walk you through how to do this and exclude certain big, temporary tables you might not want to pull in. In this video, we take the logical next step and pull our changes into a new feature branch. It's not always clear when you would need to record database changes in version control, so we explore some ideas in this video on the best way to approach updates. In this video, we talk through the process of a typical push cycle where we migrate all of the changes we've made to our development site to a our live (production) site, and compare it side-by-side to a process that includes Features-based modules that wrap up configuration changes into code. After this, you'll want to dig into the Features module if you haven't already.